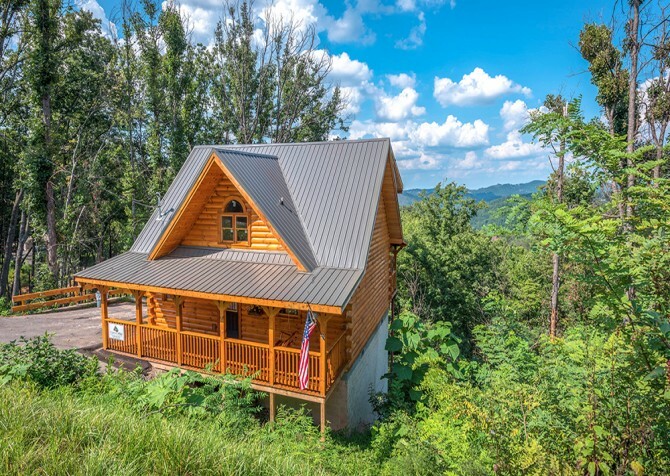 As you drive up to this charming 3-bedroom, 3-bathroom cabin, you'll be greeted by a unique green roof and beautiful log exterior. Then walk up just a few stairs into the inviting Gatlinburg getaway that will be your home away from home in the Smokies. Feel at home in the beautiful living room with fireplace and big screen TV, sit down for a family meal in the dining room, whip up meals in the fully equipped kitchen, or play pool in the rec room. The bedrooms feature comfy beds, with both kings and bunks that will keep kids and adults happy. 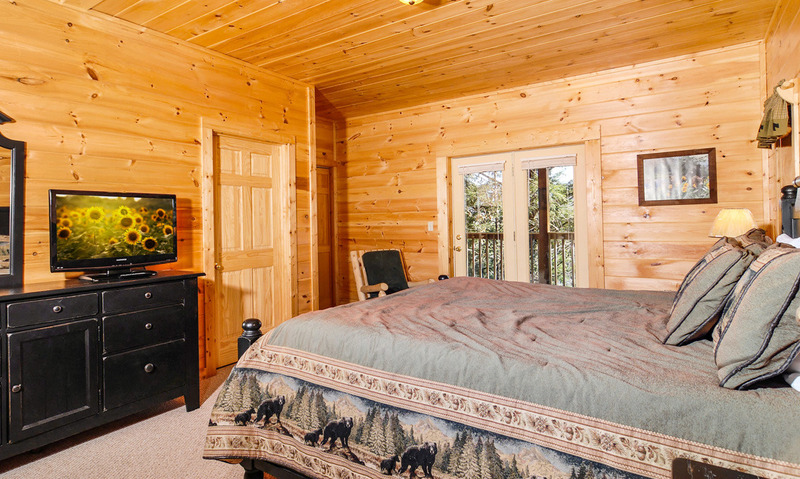 Bear Tracks offers the comforts of home, including free long distance, a washer and dryer, flat driveway, and high-speed Internet, along with access to community amenities and beautiful mountain views! 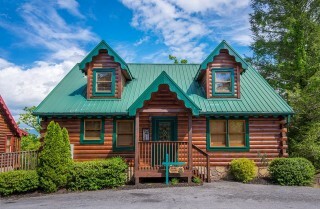 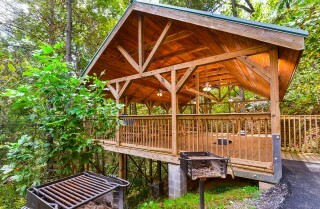 And although you'll find everything you need to relax and have fun at the cabin, you'll also be a short 5-mile drive from downtown Gatlinburg. You'll have easy access to tons of great restaurants and shops, as well as the popular attractions of the area. 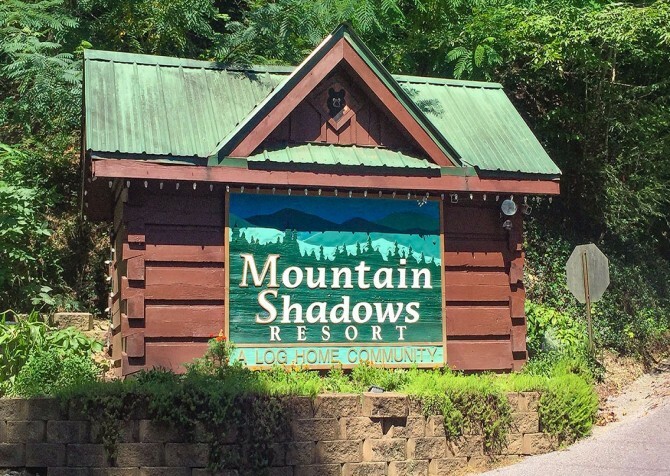 Keep everyone entertained with miniature golf, dinner shows, hands-on exhibits, and family-friendly attractions. 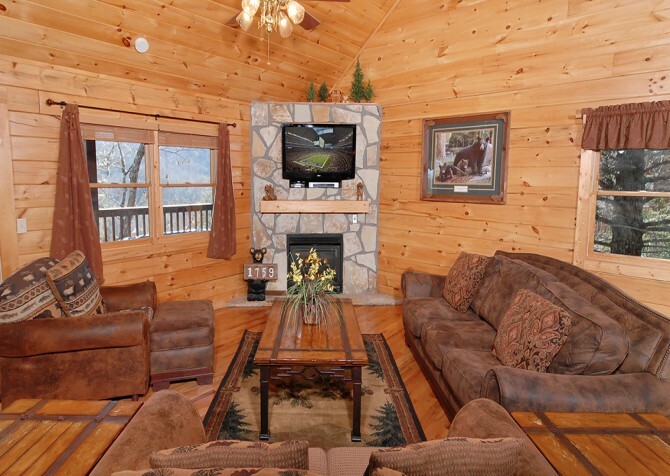 The living room at Bear Tracks will make you feel right at home when you're ready to kick up your feet and relax. 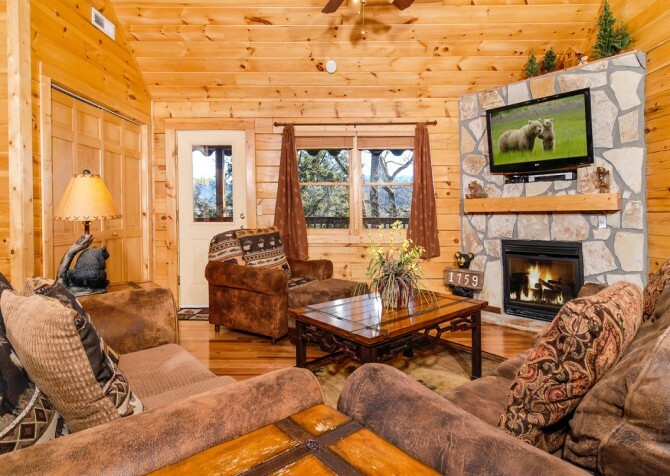 Plush sofas and a chair provide plenty of seating, and a large coffee table in the center of the room serves many purposes. 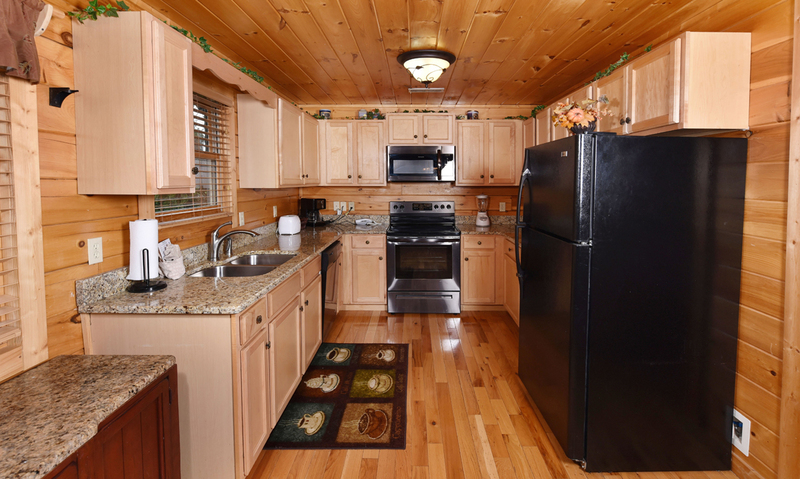 You can keep your snacks and drinks nearby or play card games and board games on a night in the cabin. 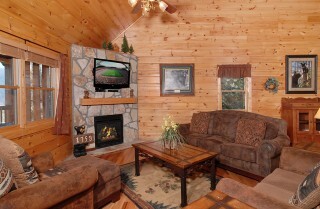 Above the mantel on the stone fireplace, a big screen TV is mounted and ready for you to watch your favorite shows, movies, or a ball game. Bring your favorite flicks to pop in the DVD player or just browse the channels on a lazy day. 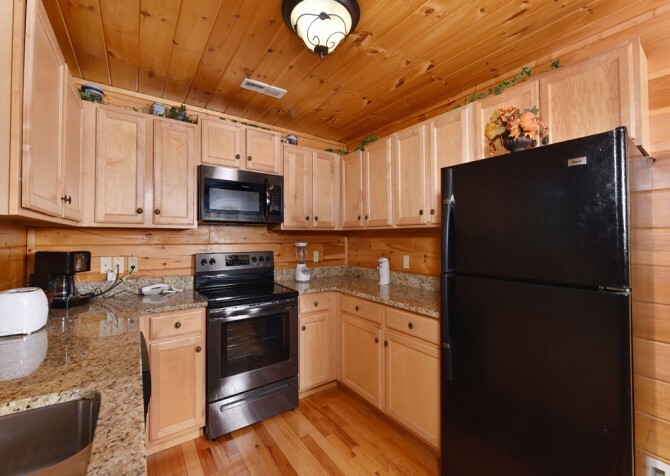 There are also several windows in this space, so you can enjoy the wooded views from inside. 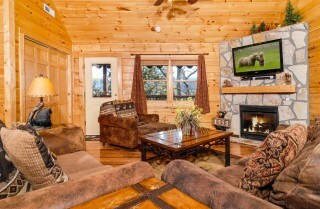 And of course, the gas fireplace will keep everyone warm on those chilly Smoky Mountain nights. 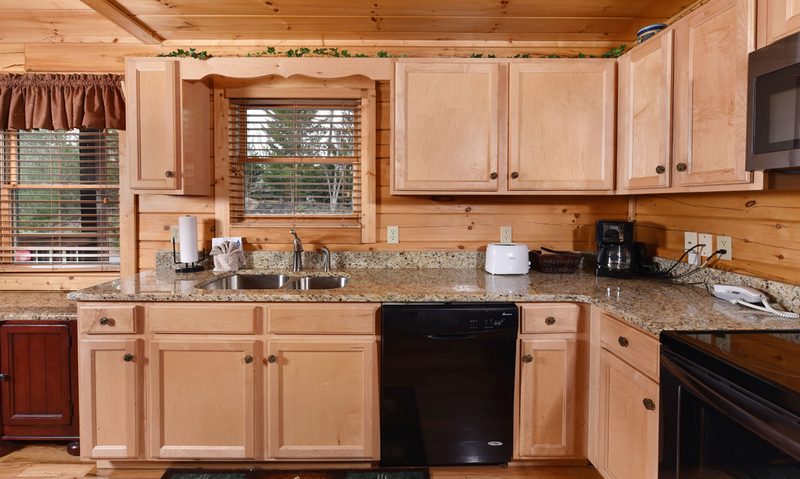 When you get away to the mountains, you may want to spend some time cooking up your own meals or snacks to enjoy in the cabin. If you don't feel like heading into town, take advantage of the great kitchen in Bear Tracks. The fully equipped kitchen has lots of cabinets and ample counter space for prepping meals. You'll also find all the appliances you need, including a refrigerator, microwave, dishwasher, oven/stove, coffeemaker, and blender. It has the tools to make you feel at home while making delicious homemade meals here. 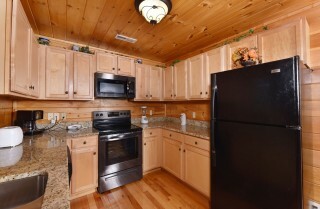 If you don't want to cook, you can just use the kitchen to store leftovers or treats from downtown. 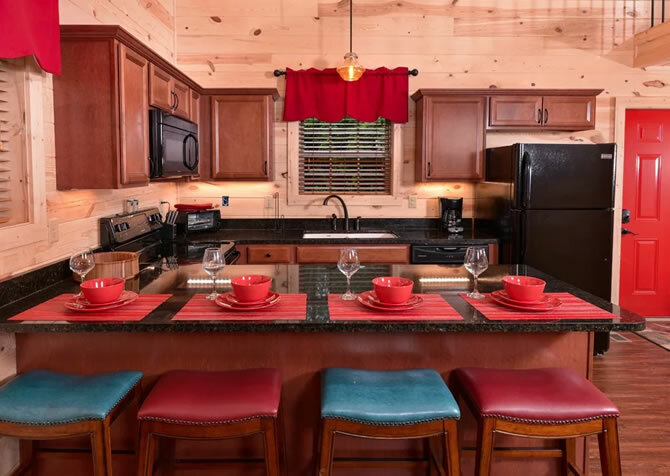 The beautiful dining area in Bear Tracks offers seating for all 8 guests, so you can sit down for a family meal together. It's perfect for holidays, special occasions, or nights you just want to get away from technology and catch up over a hot meal. 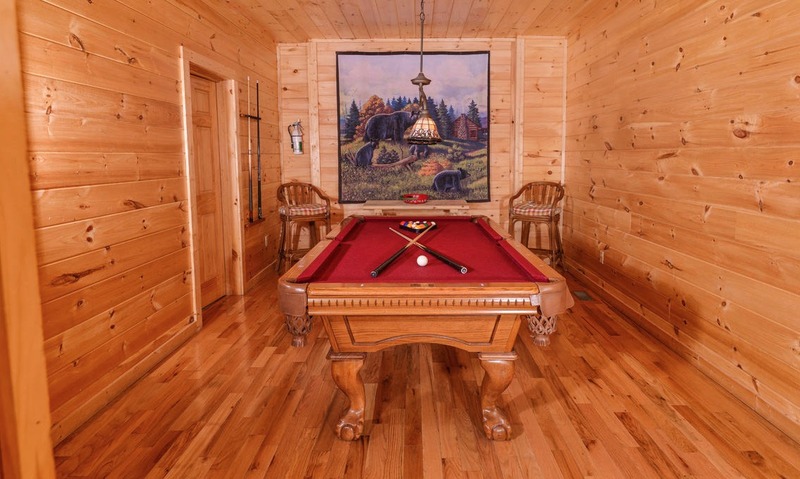 The rich wood table is complemented by elegant black chairs, and windows around the room offer a light, bright atmosphere. If you're here with several couples, this will be the perfect place to sit down for an intimate candlelit dinner. Or you can gather with the kids in the mornings for a hearty country breakfast before spending a day exploring downtown Gatlinburg! A beautiful all-wood room, the rec room of Bear Tracks is elegant and fun. A lovely tapestry with mountain motif hangs on one wall, and chairs in the corner provide seating between plays. 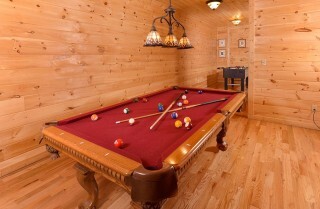 The beautiful pool table will offer hours of fun for both kids and adults in the cabin! 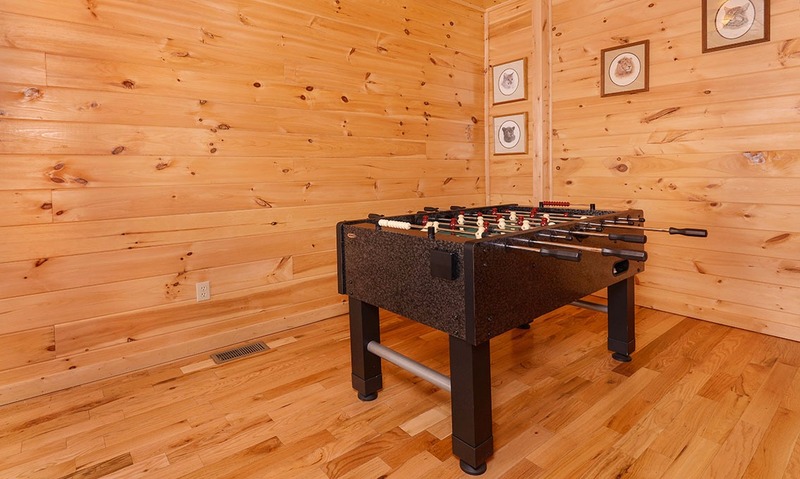 Plus, the foosball table is perfect for fun game tournaments! If you're seeking a restful retreat from the hectic pace of your life, the bedrooms in Bear Tracks will provide that and more. 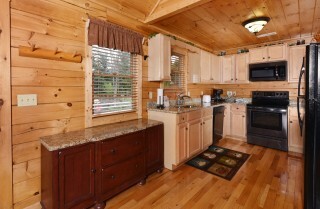 The cabin features 3 bedrooms, but it can also be rented as 1-bedroom cabin if you don't need as much space. 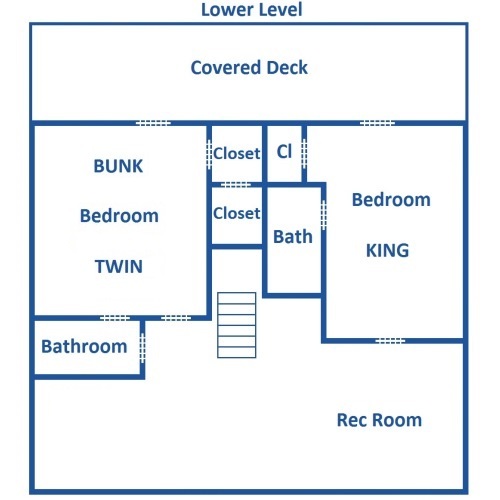 One bedroom is located on the main floor and the others are located downstairs. 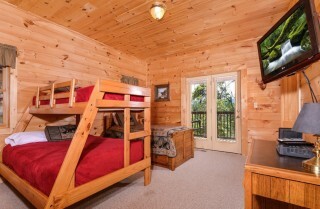 Two bedrooms have king-size beds and the other has a twin bed and a twin-over-full bunk bed. 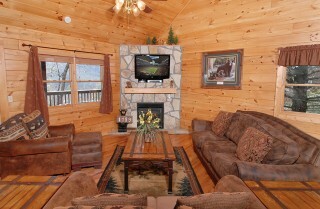 It's perfectly set up for two couples, a group of friends, or a family with kids! 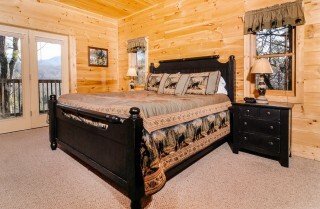 And with 3 bathrooms, guests won't have to fight over space when it's time to get ready for bed or heading into town. All have their own TVs and cozy bedding that will be welcome after long days downtown or in the Great Smoky Mountains National Park. 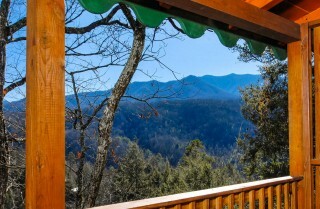 When you're in the Smokies, you have to spend at least a little bit of time in the great outdoors. Bear Tracks offers some great outdoor spaces where you can breathe in the fresh mountain air and take in the views. 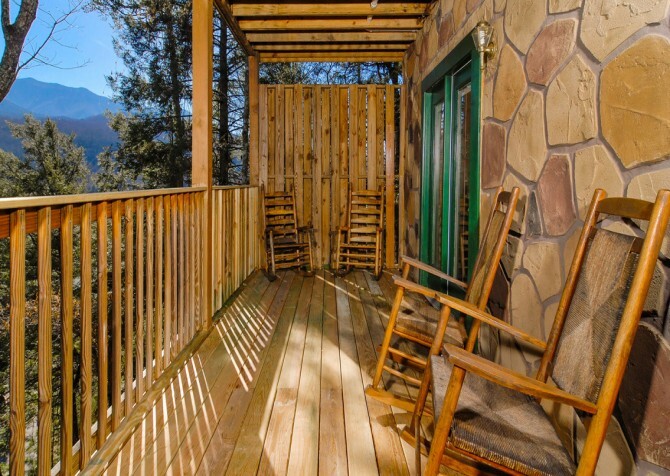 In the mornings, start your day by having a cup of coffee and enjoying the views from the rocking chairs on the deck. 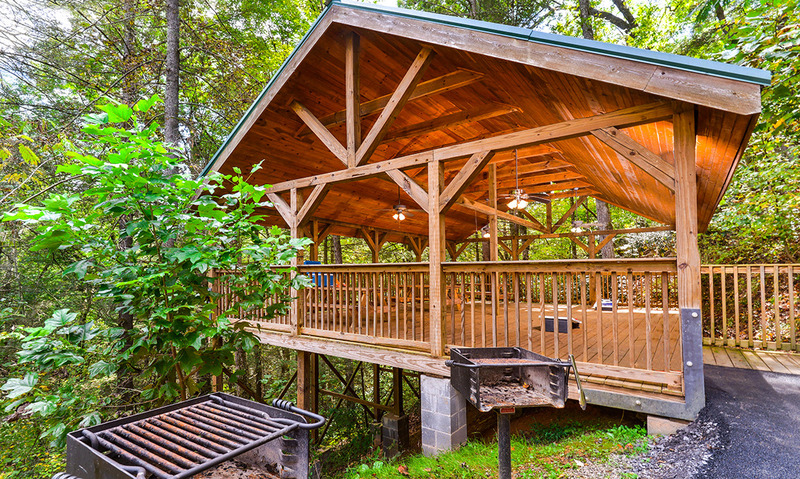 On nice nights, fire up the grill for steaks, burgers, and kabobs. 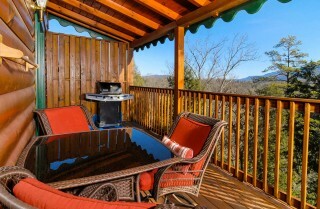 There is also a lovely table with seating for 3, which is perfect for evening drinks or afternoon snacks. 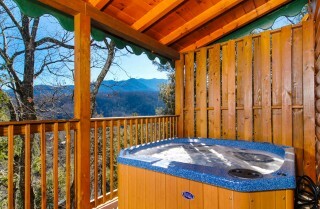 At the end of a long day, climb into the hot tub and soothe tired muscles. There is even a wood screen for some extra privacy. 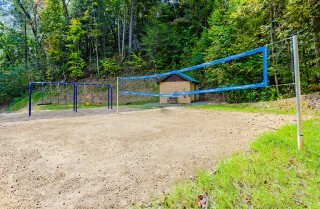 Along with the outdoor spaces at the cabin, you'll have access to some great outdoor community amenities. 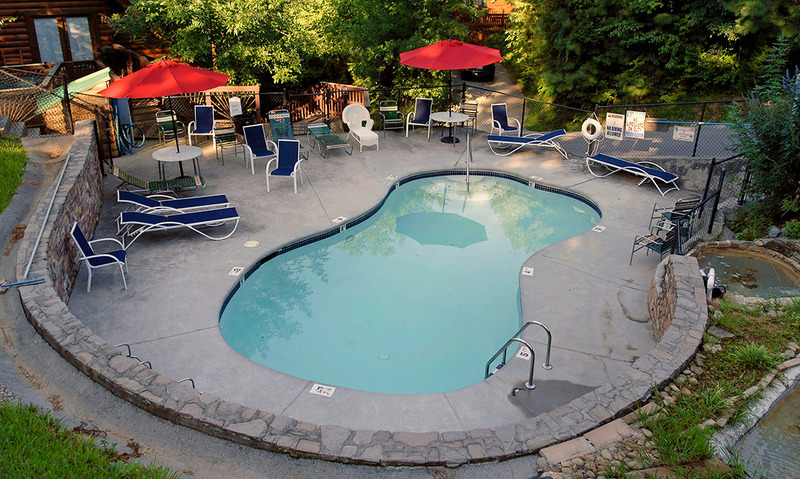 In summer, enjoy splashing around at the pool or relaxing in the chairs in the shade. There is also a swing set, volleyball net, and a beautiful pavilion with picnic tables, ceiling fans, and corn hole boards! Bear Tracks has lots of things to keep you comfortable. You can check out area attractions and events with the high-speed Internet, take advantage of the free long distance, or enjoy easy arrivals with the flat, paved driveway at the cabin. You'll also find a washer and dryer that allows you to pack light or freshen up clothes after a day of hiking. 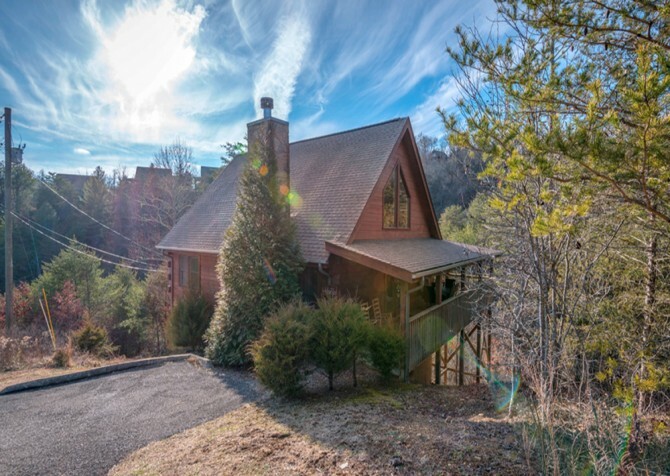 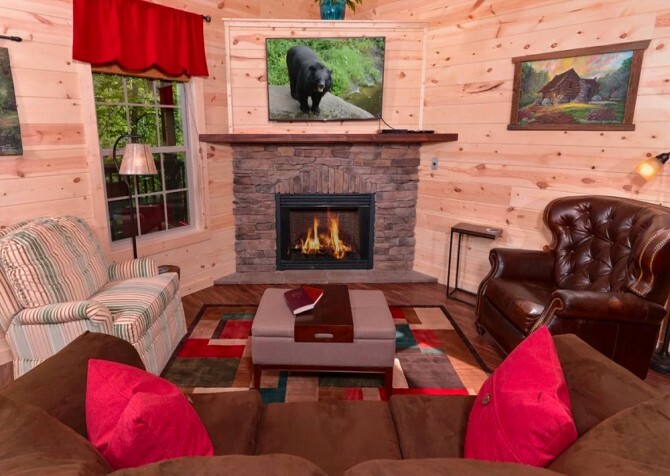 Whether you're traveling with friends or family, you'll find everything you need for a memorable stay at this beautiful cabin in Gatlinburg! You'll laugh until you cry at this local favorite, located in the heart of downtown Gatlinburg. 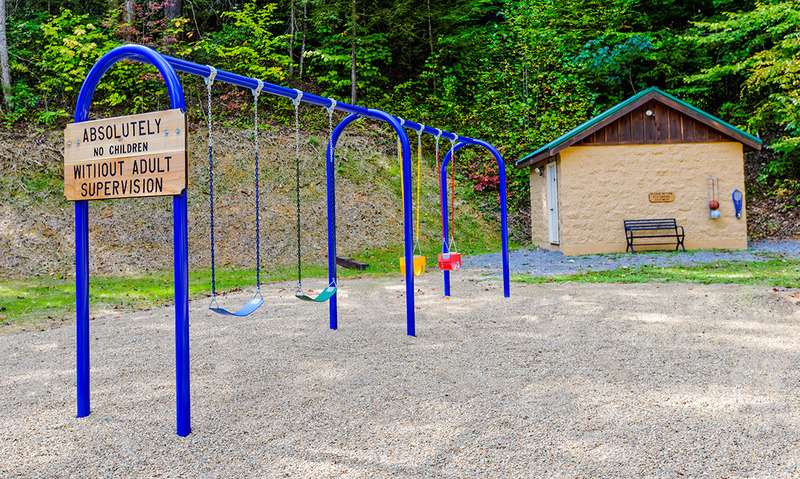 The talented performers blend music with comedy, including audience members in many of their shows! Home to more than 800 miles of trails where you can hike, bike, and go horseback riding, the national park is the most visited in the U.S. 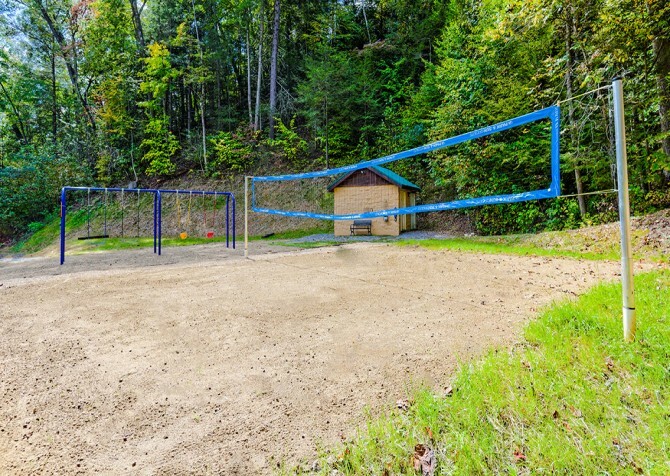 It offers breathtaking scenery and acres of fun for the whole family! 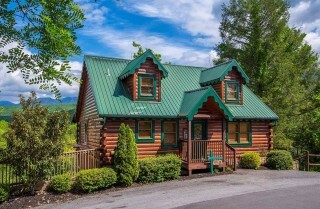 Take a scenic drive or check out some of the historic buildings that make this national park so unique. 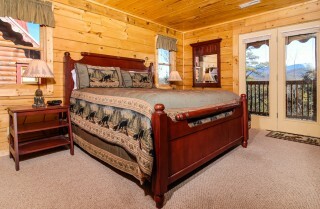 Located in Pigeon Forge, Dolly Parton's theme park has something for everyone. Along with some water rides and lots of carnival games, you'll find unique shops, delicious restaurants, entertaining shows, and fun rides! 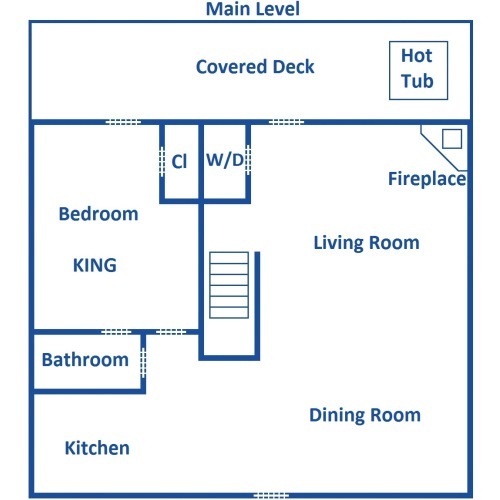 Initial rates listed are for one bedroom prices. Prices vary for use of other bedrooms, and charges will reflect in the booking engine below. 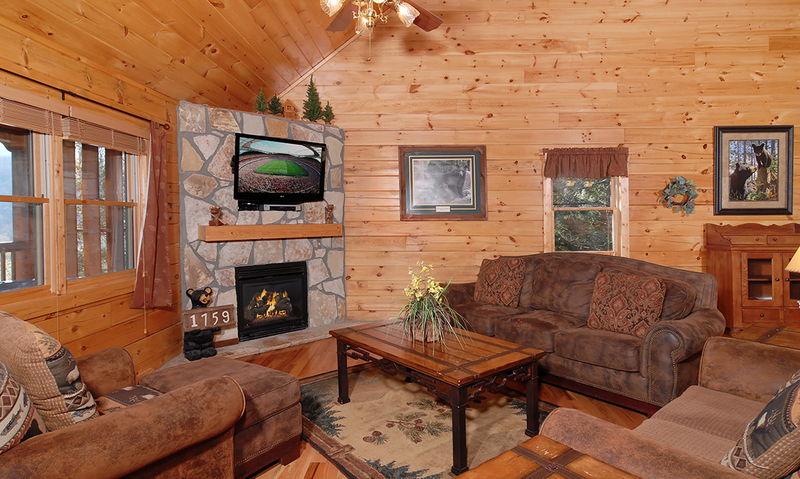 If you have questions, inquire by calling Cabins For You at 1-800-684-7865. "Amazing customer service and beautiful cabin. 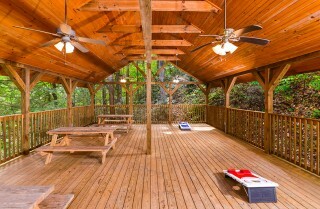 I will be using yall again!"